When they want you, they want you. 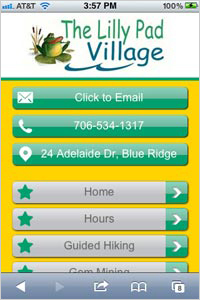 For some local services already optimizing their sites for mobile search and phones, the results may be off the hook. According to new data from DudaMobile in partnership with the Google-led GoMo initiative, one in five visitors to a mobile-optimized small business site leads to an immediate call to that business. DudaMobile claims half a million mobile sites on its platform. For this survey it monitored activity at 500 of its customers' mobile sites. Google featured DudaMobile’s research and advice on mobile site optimization at its Mobile Ads Blog. The company’s data from Q4 2011 shows that in select verticals the click-to-call rates are astronomical. Leading the way is the transportation vertical with a 44% call rate, followed by pizzerias (32%), car services (28%), auto repair (22%), home repair (20%), medical services (16%), beauty and spa (13%), retail stores (12%) and restaurants (11%). When available, users will also click through to maps and directions at an average rate of 3.25% across categories. In a new white paper, DudaMobile recommends that mobile sites keep content prioritized according to user preferences. Use the Web analytics as a starting point for ordering content, but put a premium on speed. Fast loads, bulleted-point text that is easy to read and optimized images all help the mobile user get in and out. Keep the navigation consistent and simple, preferably relying on vertical rather than lateral scrolling. Keep Back and Home buttons apparent throughout, leverage search boxes, and try not to exceed seven links per page for navigation purposes. And don’t forget the basics of smartphone use. We rely on our fattest finger -- the thumb -- for much of our navigation chores. Keep buttons near the center of the screen and with white space to avoid mis-clicks. And make the clickable area around text and check boxes generous. DudaMobile CMPO Dennis Mink cites Compuware data that shows a majority of users have a positive impression and are more likely to buy from sites that optimize for mobile -- and that 19% of mobile users get a negative overall perception of businesses that don’t offer mobile-friendly sites. 1 comment about "One In Five Visits To Mobile SMB Sites Results In A Call". Lon Bason from Harper House, February 29, 2012 at 11:30 a.m.
Why place a mobile ad that might reach a mobile consumer when you can place your Action Code in the hand of Actively Mobile Consumers via the Mar-Key CardBook? The CardBook is a printed "App" for anyone carrying a Smart phone or device...reaching as many as 500 million adults per year who spend $2 Billion Per Day related to their travel activities.